Time clocks—with punch cards and a line of employees waiting to check in or check out of work—are an almost universal signifier of the modern industrial age. Punchcards, the physical paper type, are still in wide use, but as you might expect, a digital time clock may offer more flexibility when it comes to keeping track of employee time. Redcort Software’s Virtual TimeClock family of apps provides several solutions for you to track time digitally for a variety of environments from a single office with a few users to large businesses with multiple offices in many locations throughout the country or the world. 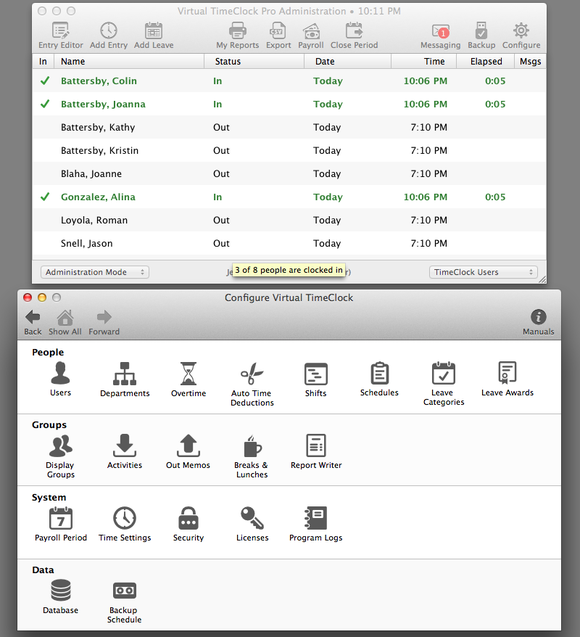 Virtual TimeClock comes in three versions: Basic Edition, Pro Edition, and Network Edition. Each of these versions is available for both Mac and PC and using the network version of the application you can have Mac and PC clients connect to your server whether it is running on a Mac or PC. The Pro and Network Editions offer almost the same set of features while while Basic Edition offers a significantly limited subset of the features found in the other two versions. Virtual TimeClock makes quick and easy work of creating a computer-based time clock. Redcort’s Basic program is, at $99, perfect for very small offices with limited needs and a few employees, but, because it offers a significantly reduced set of features, it may not provide all that you require of a perfect time clock. Virtual TimeClock Basic can be installed on a single computer and supports one administrator and up to three employees. Reports in the Basic version are limited to time sheets, which you can use for creating your payroll. Any attempts to add more than three users results in a reminder that you’ll need to upgrade to Virtual TimeClock Pro in order to continue. This upgrade offer is not your usual shill job. Virtual TimeClock Pro, which will run you $195, is, by any estimate, significantly better than is its less-expensive, three-user sibling. 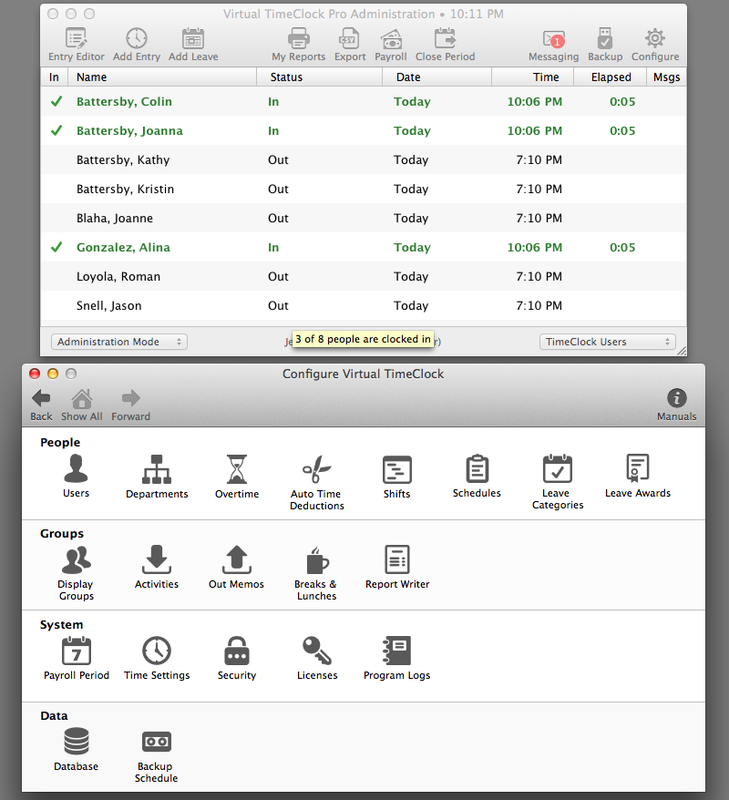 While Virtual TimeClock Pro can also only be run on a single computer, which also makes it the only computer on which your employees can log in to, it supports an unlimited number of users, automated backup, integration with a number of payroll systems (including Paychex, ADP, and QuickBooks), shift support, a large collection of reports, departmental support, and, among even more options, a built-in messaging system your employees can use to communicate with managers and other employees. There are two options for adding users to Virtual TimeClock. You can enter each user manually using the application’s user entry tool or you can import users either from a QuickBooks .iif file or in a properly formatted CSV file. I discovered a couple of manual data entry oddities. First, when entering a new user’s name the initial field came third when tabbing through. Understandable, but unexpected when you’re touch typing and not looking at the screen. Furthermore, the initial field allows you to type more than one initial, adding to the confusion. Also, pressing the return key doesn’t create a new record and open a new, blank user screen, thus requiring your hands to move from the keyboard to the mouse or trackpad. A preference for changing this behavior would be useful. Virtual TimeClock’s Network Edition, which starts at $295, is exactly the same as Virtual TimeClock Pro except that it as accessible to your users from any workstation on your WAN, LAN, or even from remote locations via the Internet. The application requires that you set up a Virtual TimeClock server, although this does not mean that it has to be a Mac or PC running server software, it merely means that you must have a computer that is running and available on your network. This computer does not require that anyone be logged in as the Virtual TimeClock server uses a system daemon run in the background even when it’s sitting at a login window. Two types of clients connect to the server. One is a simple time clock station that your users use to punch in, the other is an administrative app that allows you to remotely manage the way your time clock presents information to your users and how it allows them to log in. Access within your network works seamlessly, while Internet-based access may prove more challenging. You will definitely need ports mapped from your external to internal addresses, and will either need to have a fixed external IP address or use a dynamic DNS service such as Dyn. Once these things are in place access to your time clock over the Internet is seamless. Virtual TimeClock uses a method of authenticating users that may potentially reveal another user's password. I have one rather large security concern with all of the Virtual TimeClock apps, which I also made mention of in my review a couple of years ago: Passcode security isn’t what it should be. Virtual TimeClock uses pins and passwords to authenticate users. This means that when creating or changing a passcode you get an error message when you use a passcode someone else has already used, thus exposing the system to potential unauthorized access. This really needs to be addressed in the next version of Virtual TimeClock. Security concerns aside, the family of Virtual TimeClock applications provide an excellent way to track your employees' time. Excellent reporting tools in the pro versions, export to most any payroll service, and network-based time clock options make Virtual TimeClock an excellent time tracking choice.